Nevada’s $1 billion push to improve the state’s education system has drawn the headlines, but a less-heralded drive could deliver quicker results in upgrading the state’s workforce. Though Western Governors University was founded nearly 20 years ago, a partnership with Nevada in June expanded higher education options for state residents. The online, nonprofit, competency-based university offers more than 50 undergraduate and graduate degree programs in the areas of business, K-12 teacher education, information technology and health professions. Las Vegas resident Jax Lutz is scheduled to begin pursing a Bachelor of Science degree in accounting this October. As an operations manager at Savers, Lutz said obtaining a degree from WGU Nevada will help her earn more money and work toward her goal of becoming a certified public accountant. Terms at WGU are six months and students may begin on the first day of any month. “The great thing with WGU is you take one class at a time, which allows you to really focus and absorb all the information,” Lutz said. WGU Nevada’s price tag, she said, is also appealing. Tuition is approximately $6,000 a year for most programs and is charged at a flat rate. It has not increased since 2008. Pursuing higher education was on the mind of Las Vegas resident Andrea Petty when she moved from Salt Lake City two years ago. Petty graduated from WGU in December 2014 with a degree in marketing management. 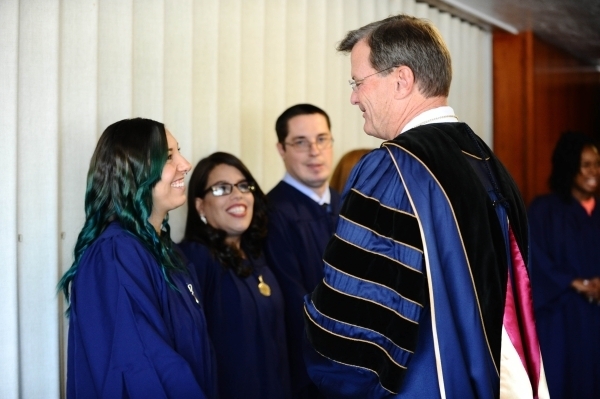 WGU degrees are accredited through the Northwest Commission on Colleges and Universities. Teachers College programs are recognized by the National Council for Accreditation of Teacher Education and nursing programs are endorsed by the Commission on Collegiate Nursing Education. Petty now oversees social media management and digital marketing for various clients. Lutz and Petty are just two Nevadans who have sought to continue their education at WGU Nevada. According to Jeff Burton, public relations manager at WGU Nevada, 900 students enrolled in June, followed by another 100 new students in August. He anticipates an additional 180 will enroll this month. “Application numbers have gone up as people continue to learn more about WGU,” he said. Whether or not enrollment at WGU Nevada does rise, Nevada System of Higher Education Chancellor Dan Klaich said he views the online university as an asset, not a competitor, for the state. Klaich added that Nevada has a big job to do to in order to raise the attainment level of the workforce by 2020. Nevada does, however, have a responsibility to look at any and every method of delivering public higher education, Klaich said. He anticipates the future of education in Nevada will include increased pressure on higher education institutions to become more aligned with the state’s economic development plan in order to build a skilled workforce to help Nevada attract more businesses.